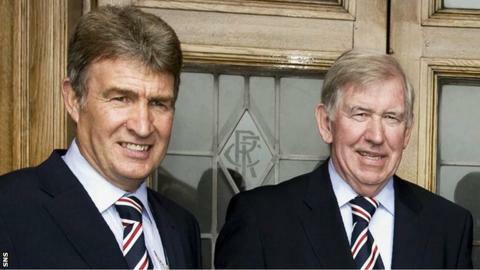 John Greig described Sandy Jardine as "like a little brother" as he reflected on the death of his fellow Rangers great. Jardine, who lost his battle with cancer on Thursday aged 65, played beside Greig for more than a decade. They won the European Cup Winners' Cup in 1972 and Greig was also Jardine's manager at Rangers. "He was always there to support me, he was a very good friend to me and I will miss him badly," said Greig. "Sandy and I go back 50 years to when he turned up at Haymarket Station one morning to travel through to Ibrox to become a Rangers player, having just left school. "For many years we travelled together back and forward from Edinburgh to Glasgow. When he got married he moved into a house just around the corner from me and became very close, both as a team-mate and a personal friend. "I couldn't believe it when he told me about his illness and had nothing but admiration for the way he did every single thing the doctors told him to do. "He must have been in an awful lot of pain at times but I never heard him complaining. That's the kind of person the guy was." Right-back Jardine played more than 600 games for Rangers and represented Scotland 38 times. Greig was manager at Ibrox when Jardine left to join his boyhood heroes Hearts in 1982, where he collected his second Scottish player of the year award at the age of 37. "That was something I didn't want to do but because of his service to the club, and the fact he'd been a Hearts supporter as a kid, he fancied finishing his career there," Greig told BBC Scotland. "It was a kind of a reward for his services and he proved with what he did there that he was far from finished as a footballer." Former Hearts striker John Robertson was at Tynecastle when Jardine arrived at the club. "It's a huge, huge loss to everybody in Scottish football," said Robertson. "Class is probably the best way to sum him up. "He arrived at Hearts, along with manager Alex MacDonald, when we were on our knees. Those guys were instrumental in making Hearts a competitive club again and everything he did oozed class. "When they came to Hearts they wanted to raise the standard in terms of fitness, ability and how the players conducted themselves on and off the park. They brought a standard they felt was lacking at the club and Hearts kicked on from there. "Alex MacDonald and Sandy Jardine were legends at Rangers Football Club. However, it shows the impact they had at Hearts because they are equally regarded and held in the same esteem by the fans for what they did at Tynecastle. "Sandy Jardine was one of the finest players Scottish football has ever produced. At 37, when he took Hearts to the brink of the double, he was miles ahead of everybody, the way he could read the game and pass it out from the back. "He was a great man and is a huge loss to Rangers Football Club, Hearts of Midlothian Football Club, and Scottish football in general." Tommy McLean, who played beside Jardine for 10 years at Ibrox, said: "Everybody is agreed he was a top, top player but over and above that he was a fine gentleman. He always had the fans in mind and was a Rangers man through and through." At the 1974 World Cup, Jardine and Celtic's Danny McGrain were voted the best full-back pairing in the tournament. McGrain described his former Scotland team-mate as "Mr Perfect" and one of sport's "good guys", admitting he had a tear in his eye when he heard of Jardine's death. Rangers players will wear black armbands and there will be a pre-match minute's silence as a mark of respect for Jardine when Stranraer visit Ibrox on Saturday.